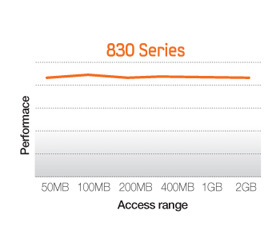 The 830 Series’ 520MB/s sequential read speed provides lightning fast access to your files, loading large multimedia files quickly and smoothly. 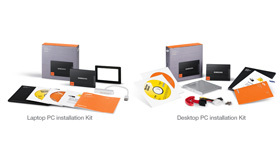 The Samsung SSD 830 series is available with a user-friendly installation kit, including a full version of Norton Ghost, an interactive installation guide, and premium installation tools for both desktops and laptops. Use the wider image option when adding this feature. We would like to capture all of the data represented on this specific feature image. However, do not use this feature image in this document, use the actual image in images folder. 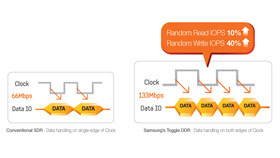 Samsung’s 20-nanometer-class toggle DDR NAND Flash chips enable data transfer rates of up to 133 megabits per second (Mbps)-more than three times faster than conventional (40 Mbps) single-date-rate (SDR) NAND Flash chips. 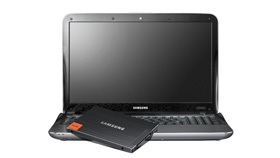 While most SSD makers rely on generic, dual-core controllers, Samsung has developed its own proprietary, triple-core MCX controllers that excel in multi-tasking and help to assure stead performance over time. Based on an ARM9 controller, its three CPU cores can execute multiple instructions such reading data, writing data and optimization. 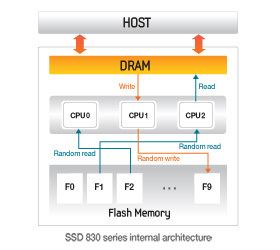 256MB of DRAM cache memory helps maintain stable random read performance, even if the access range is increased. 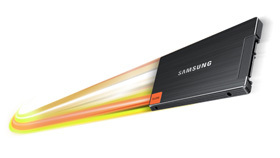 The Samsung SSD 830 Series boasts superior random read speeds (up to 80,000 IOPS) and faster sequential read and write speeds (up to 520 MB/s & 400 MB/s respectively). It’s the ideal solution for your everyday computing needs, such as web browsing, document creation, viewing or editing multimedia files, playing PC games, etc. 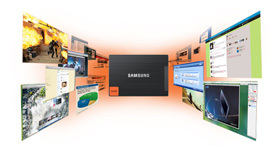 Samsung’s SSD Magician software eliminates the confusion and uncertainties of SSD management, making it simple for users to maximize the performance and lifetime of their Samsung SSD. The software helps to maintain the SSD at its peak condition, giving you the same great performance and reliability throughout the life of your PC. In addition to its performance maintenance features, SSD Magician also provides system information and facilitates performance benchmarking, performance optimization, OS optimization, firmware updates, secure erasing, and over provisioning. More links for "**B Grade** 128GB SSD 830 Desktop Series SATA 6Gb/s KIT with Norton Ghost - (MZ-7PC128D/EU)"